When I realized I would be spending my birthday in Nashville, I knew it would be a great opportunity to go for a “special meal” (not that I ever need an excuse). Catbird Seat was at the top of my list, but when the reservations opened for the date I wanted, there didn’t seem to be any available. Disappointed but knowing I had more days in Nashville to shoot for, I researched the reservation “game” some more, took into account the time change, and had my finger clicking “refresh” over and over until the time came for the reservations would become available. I was dumbfounded when in a blink of an eye, again there was no availability. Frustrated, but with a glimmer of hope, I tried one last time the next day. As I sat again with my finger hitting the refresh button I was thankful that I was going to be in Nashville for 4 nights and had the opportunity to try for what seemed to be the hardest reservation I’ve ever scored. But again, the time went by and I missed out again. I was in disbelief. I pride myself in being very good at getting hard to get reservations. 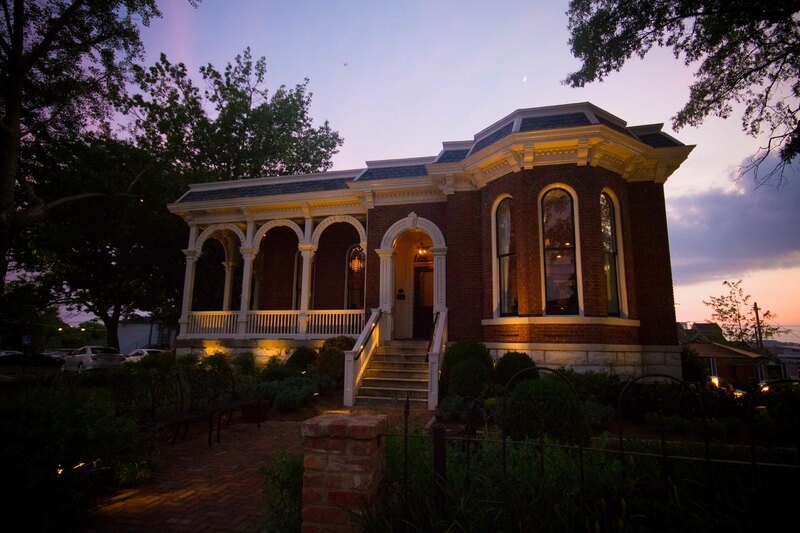 I have beaten the system and scored reservations to The French Laundry, Alinea and even Tickets and 41° in Barcelona, and Catbird Seat in Nashville was going to be my downfall? I started doing research for another special restaurant and came up empty-handed on those too, I started to realize that this wasn’t a city’s conspiracy to keep me away from their great dining scene, but just one who takes its 4th of July seriously and closes their restaurants for the week preceding its Nation’s Birthday. That meant my vacation in Nashville the week of my birthday would not see me at Catbird Seat ,City House or Rolf and Daughters. Thank goodness for that Nashville is such a great dining city, so it wasn’t like I’d be shut out completely from experiencing the scene. 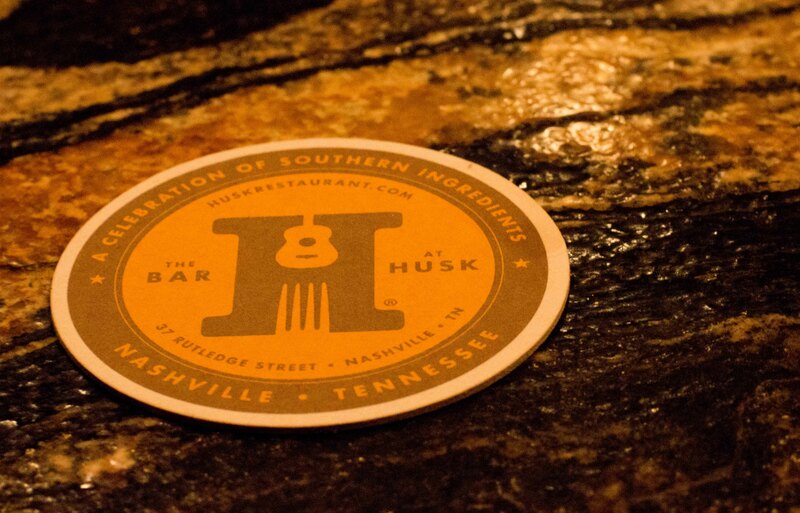 I had come up with a few options for where I wanted to spend my birthday, but in the end I couldn’t deny the lure of Husk, Nashville. My lunch at Husk, Charleston was one of my favourite meals of that leg of the trip, and when I heard that not only was Sean Brock’s menu different, but perhaps “better” in Nashville, I thought it would be the perfect place to overindulge on my birthday. 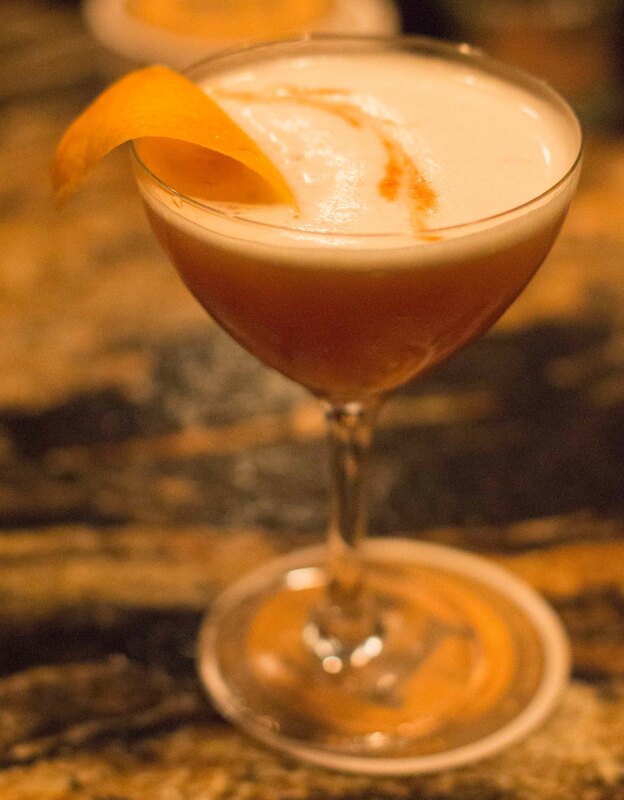 The evening was started at the bar with a perfect “dealer’s choice” bourbon sour. It seemed like the heaviness of my past week in the South was catching up to me and I was really craving vegetables and fish. I was thankful I was spending my birthday with an easy-going group (plus a vegetarian) who agreed to try to stay away from the meat courses on the menu. I was also curious if Sean Brock’s passion for Southern indigenous crops would shine through in a veggie centric meal. We chose what we felt was an appropriate amount of dishes to share, but what we didn’t account for was all the extras we’d be served. Seems like Cousin Alex’s connections in Nashville got us some delicious additions. 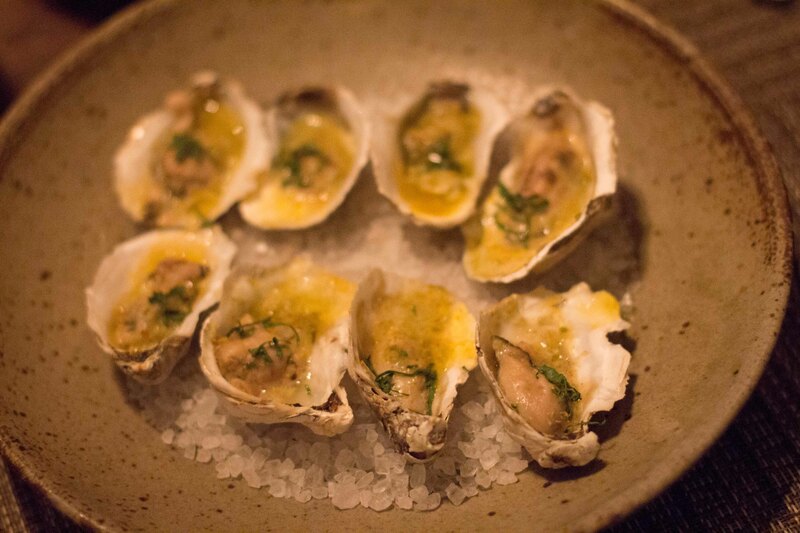 Rappahannock Oysters, Green Garlic Butter, Southern Bottarga, Preserved Lemon – I was expecting raw, so I was surprised when these hit my mouth. 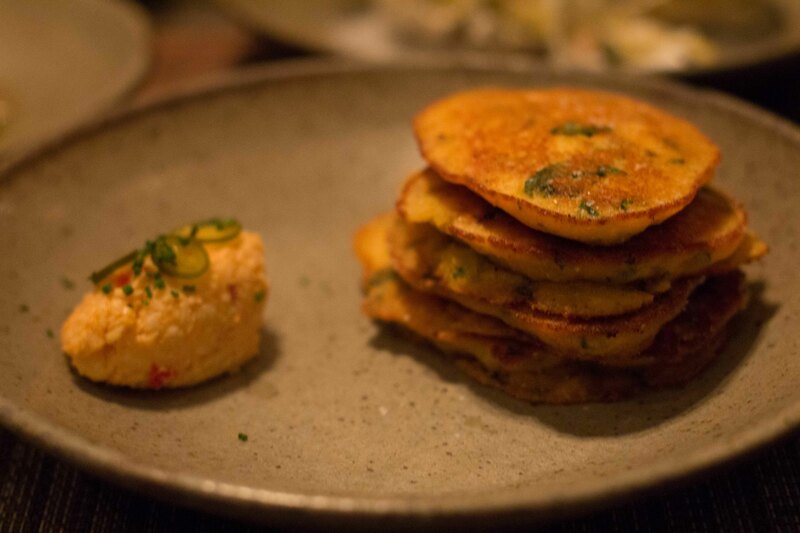 Hominy and Swiss Chard Johnny Cakes with Pimento Cheese – I was so happy when the pimento cheese hit our table,. It was nice to celebrate my birthday with a “new friend”. 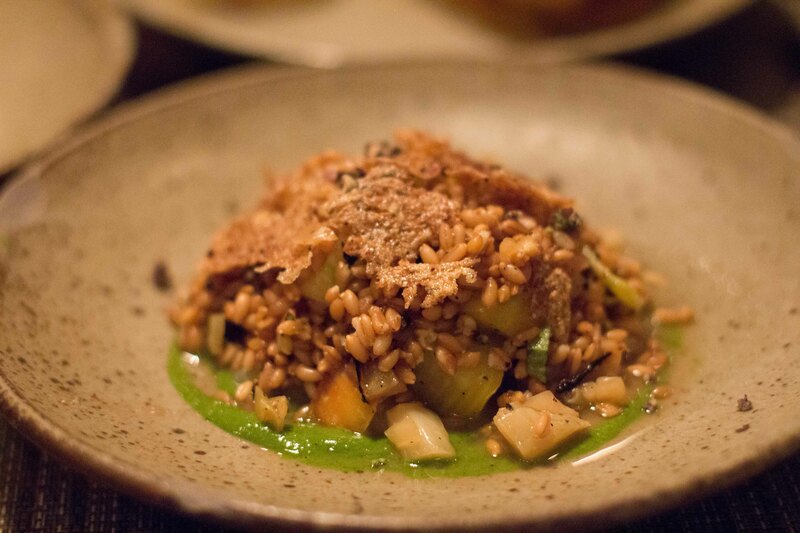 A Salad of Farro, Brassicas and Tomatoes, Charred Lemon, African Blue Basil – a “bonus” dish that I’m happy we were served. The components of this dish were complimentary and all so very delicious. 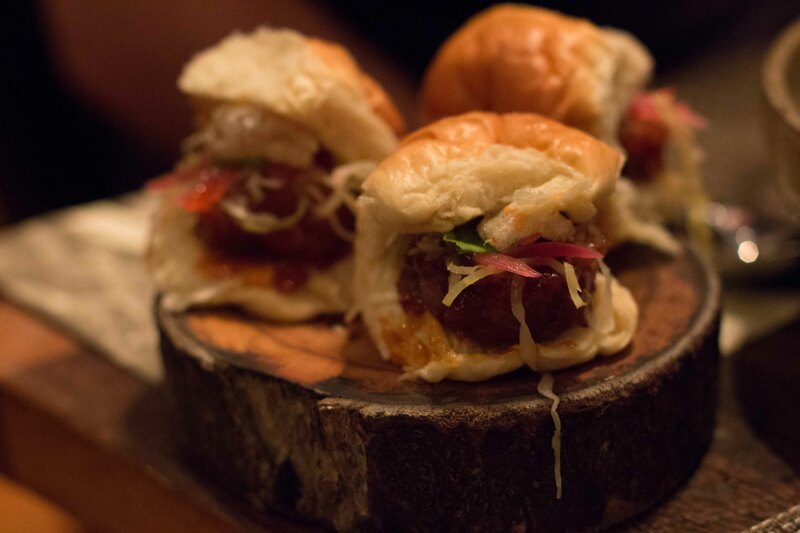 HUSK Pork Buns, Sour Cabbage, Pickled Red Onion, Smoked Duke’s – We just couldn’t go a meal without being served pork. “Pork bun” in my mind has an Asian connotation, these were not at all Asian, but a great bite nonetheless. 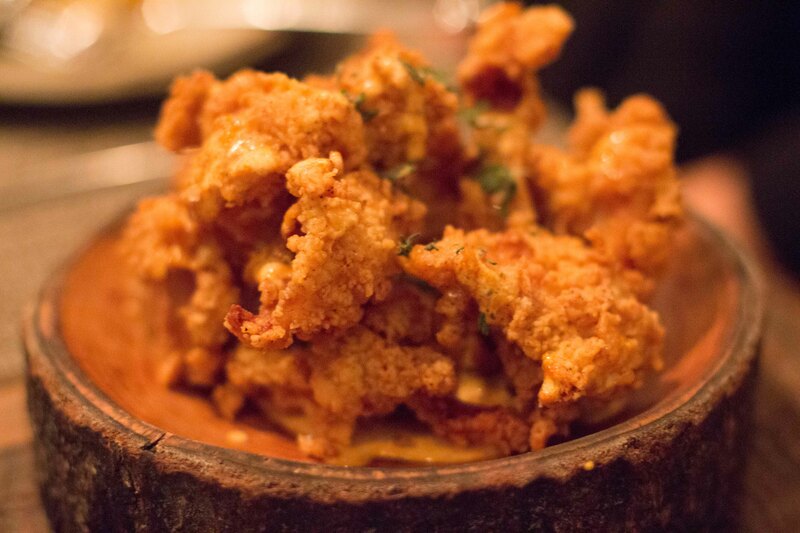 HUSK Chicken Skins, AL White Sauce – I knew this was so bad for me, but couldn’t help diving in for more. I couldn’t help but chuckle when the lightbulb went off when I realized that Alabama White sauce turned out to be what was called “White Trash” sauce at my dinner at Ma Peche last year. 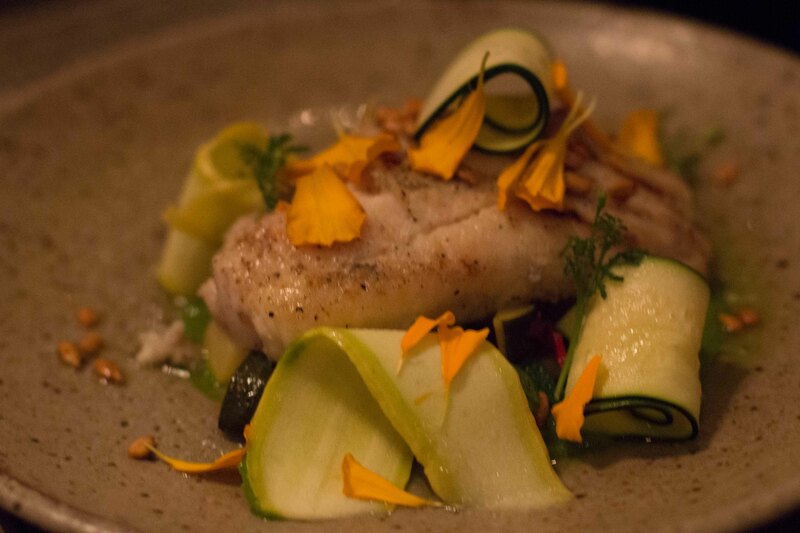 Grilled Catfish, Courgettes and Summer Flowers – my experience with catfish has been that it’s always tasted “muddy” so I usually stay away from it. But here, it was sweet and succulent, what I imagine it’s what it is in its perfect form. 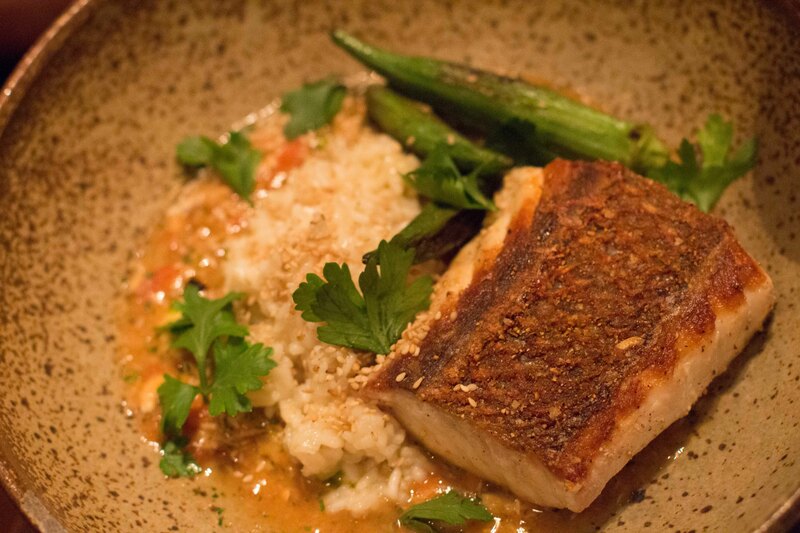 Gulf Snapper, Gullah Fish Head Stew, Embered Okra, Carolina Gold Rice- Yes there was a protein on this plate (snapper) but I was too busy swooning over the rice and okra to notice it. 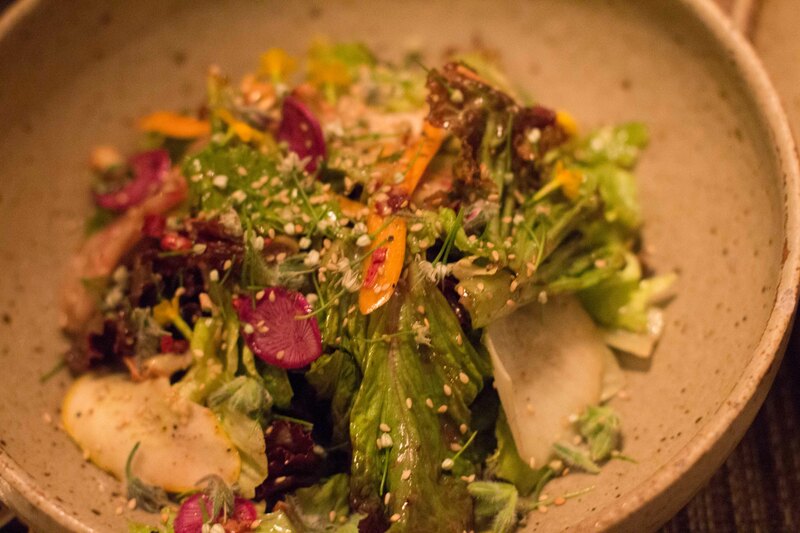 A Plate of Southern Vegetables – A love letter to veggies. I could possibly think of becoming a vegetarian (if not for the fact I love meat so much) if veggie plates were always this complexly delicious. I was extremely pleased with dinner. I appreciated that our vegetable focussed dinner was so incredibly flavourful. 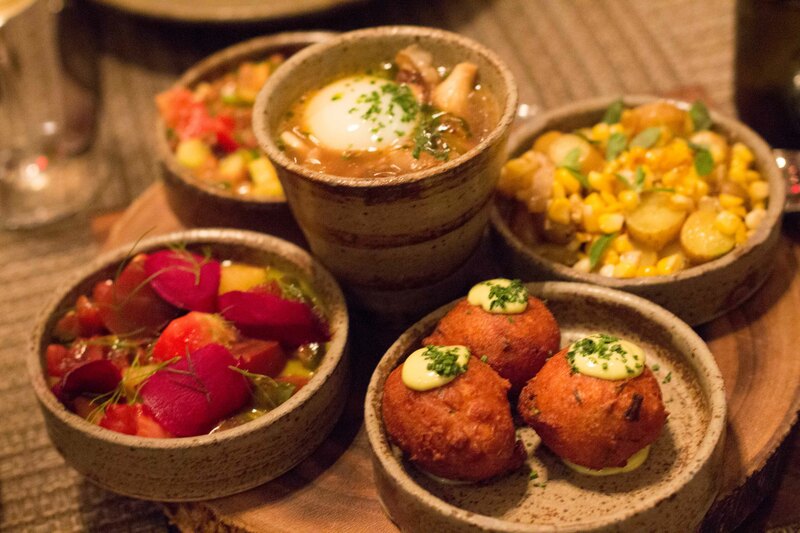 I loved the fresh flavours and variety of textures that kept my palate excited. Above all, I was happy that even though I was stuffed, it wasn’t a “meat heavy”. Not that we needed it, we decided to order 1 dessert to share. 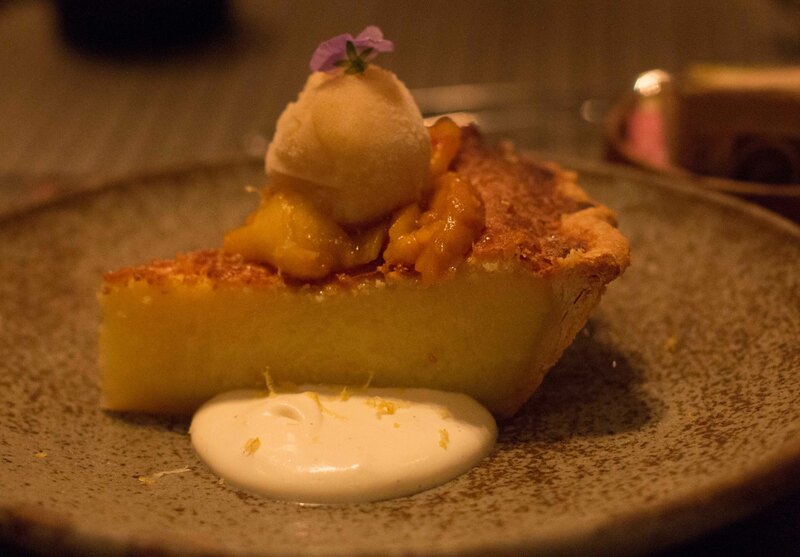 Buttermilk Chess Pie – GA Peaches & Cream – Apparently the most “Southern” of all the dessert choices on the menu. 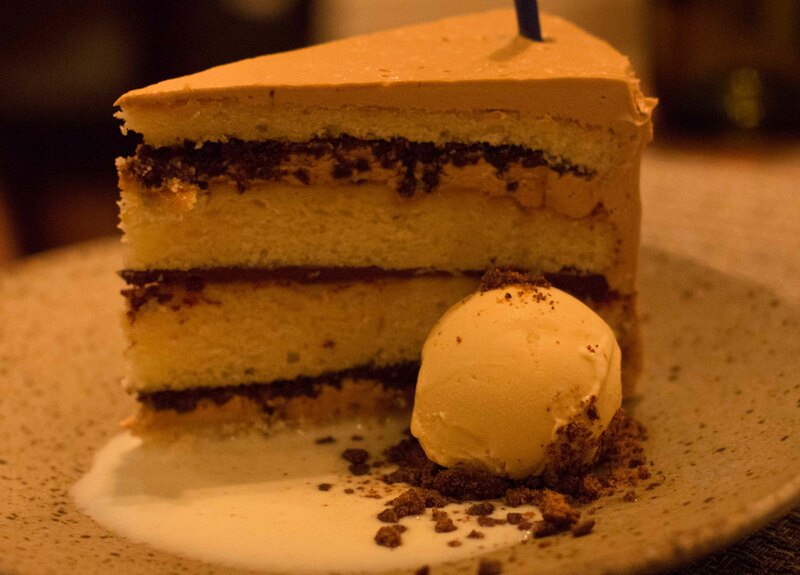 Crema Coffee Cream Cake with Chocolate Espresso Ganache, Coffee Bean Brittle, Cinnamon Tres Leches, Goat’s Milk Jam Ice Cream – Because it was my birthday, we got an extra treat. After dinner, we had a perfect plan to end the evening and to help us get over our overindulgence. 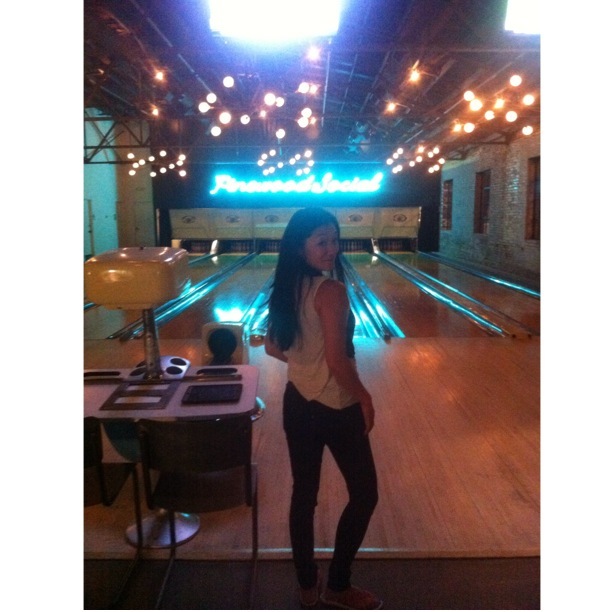 A game of bowling and another cocktail (or 2) at the awesome Pinewood Social which is such a cool multi-functional space. I officially declare, I am the worst bowler, but had a great time nonetheless. Happy Birthday to me.